A new transmission and updated technologies for the 2018 RLX. 2018 Acura RLX Sport Hybrid. My, how fast time passes by. 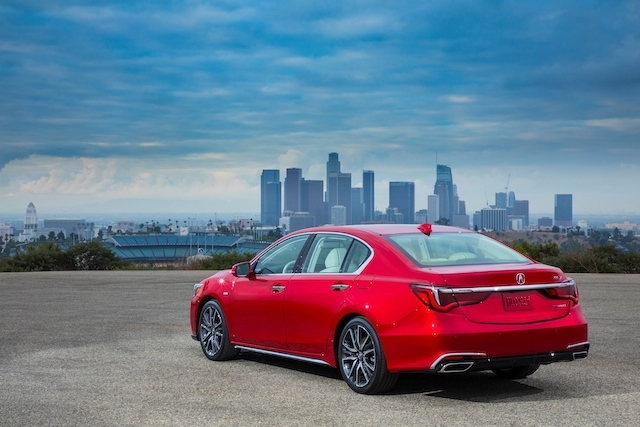 It hardly seems possible, but the Acura RLX is now in its fifth model year. Acura’s flagship replaced the RL beginning in 2015 and has served the brand well. And unlike other top-of-the-line models, this one comes with standard front-wheel drive and a V6 engine. 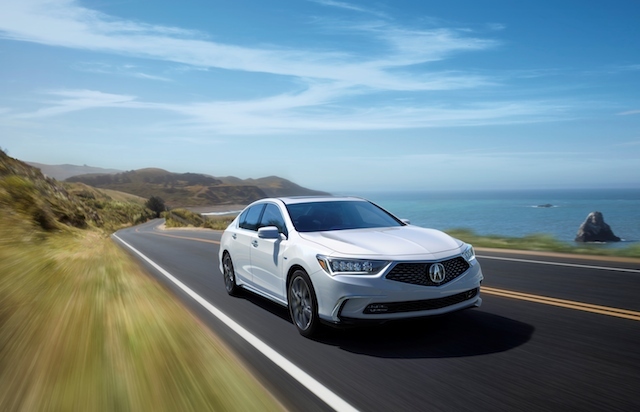 The 2018 model reflects a refresh, most notably new front and rear styling advancing Acura’s latest design language. Specifically, the front fascia amplifies Acura’s diamond pentagon grille, a look that gives this sedan a much more stately appearance. Other design changes extend to the hood reflecting more pronounced sculpting, a fresh set of wheel designs, updated LED taillights, and a gloss black diffuser marked with a pair of exposed dual exhaust finishers. The look is at once luxurious as it sporty. Inside, the 2018 Acura RLX offers redesigned Milano leather seats featuring high-contrast piping and stitching, an array of new soft-touch materials, and new interior color choices. One of the unique points about the Acura RLX is the drivetrain choices. Both the front- and all-wheel drive models come with a 3.5-liter V6 engine, generating 310 horsepower at 6,500 RPMs and 272 pound-feet of torque at 4,500 RPMs (273 at 4,700 RPMs in all-wheel drive). The front-wheel drive sedan now has an all-new 10-speed automatic transmission and continues with all-wheel steering. The all-wheel drive RLX (marketed as Sport Hybrid) has a 7-speed dual-clutch transmission. The difference with the all-wheel drive model is that it adds three electric motors — one on the front axle, two at the rear wheels, creating a hybrid electric vehicle. Performance benefits tremendously, increasing total system horsepower to 377 horsepower and 341 pound-feet of torque. Fuel economy estimates from the EPA come in at 20 mpg in the city and 29 mpg on the highway with front-wheel drive and 28/29 with the Sport Hybrid. Both RLX models have the AcuraWatch bundle of safety and driver-assist features, including the new-for-2018 Traffic Jam Assist. This feature works alongside two other technologies — adaptive cruise control and low speed follow. In essence, Traffic Jam Assist keeps the sedan centered in its lane along with providing a set interval between vehicles. Other package features include collision mitigation braking, forward collision warning, lane keeping assist, and road departure mitigation with lane departure warning. The front-wheel drive model also has a rearview camera; the Sport Hybrid comes with a surround-view camera system. Both models include automatic headlamps, hill start assist, an electronic parking brake with automatic brake hold, rain-sensing windshield wipers, and heated side mirrors with reverse gear tilt-down. Exclusive to the Sport Hybrid you’ll also find front and rear parking sensors, windshield deicer, and automatic dimming side mirrors. Both models offer a 14-speaker audio system. The hybrid has a Krell premium audio system, while the standard sedan has an in-house unit. Standard features include HD Radio; satellite radio; Bluetooth, Aha, and Pandora compatibility; USB audio interface and an auxiliary input jack. The hybrid also has a head-up display as well as remote engine start. Acura prices the 2018 RLX from $55,865, including destination, for the front-wheel drive model and $62,865 for the Sport Hybrid. Notably, the Sport Hybrid’s price reflects a reduction of $4,050 when compared to the 2017 model equipped with the Advance Package. The $7,000 difference between models seems steep at first, but the Sport Hybrid adds numerous additional features, including some already mentioned. Other upgrades include LED fog lights, heated and ventilated front seats, heated outboard rear seats, a power rear sunshade, and manual rear door side sunshades. The RLX may be Acura’s flagship, but sales are very small — only 99 units sold last month compared to 2,668 for the midsize TLX sedan. The biggest Acura sellers are a pair of crossover utility vehicles (CUVs) — the MDX and RDX. 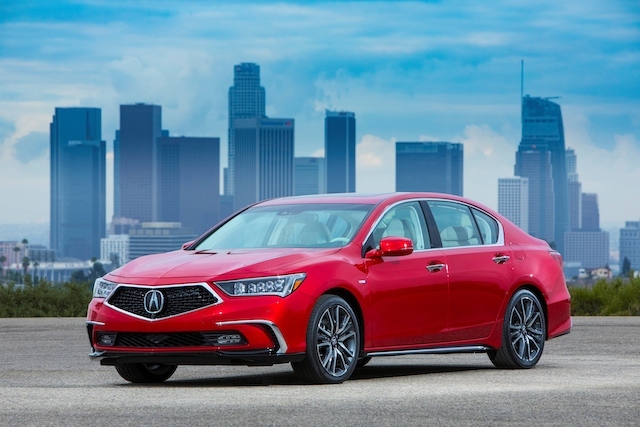 That said, Acura continues to hold the banner high with the RLX, a refreshed model with a new look and a price overhaul strategy to go with it. Photos courtesy of Honda Motors of America (Acura).